Last evening I attended a panel discussion entitled, “Making the Web work for Science” hosted by Science Commons. It was held at the Commonwealth Club in San Francisco and moderated by Tim O’Reilly. On the panel were Jimmy Wales, founder of Wikipedia; Stephen Friend, MD, PhD President, CEO and a Co-Founder of Sage; and John Wilbanks, VP of Science at Creative Commons. While I was hoping more would be discussed on modeling the habits of researchers with web tools, the focus on Open Science was still a good conversation. At one point, Dr. Friend mentioned the need to publish negative results. With the ability to inexpensively self-publish and distribute data on the Web, why then, aren’t we seeing more of this? 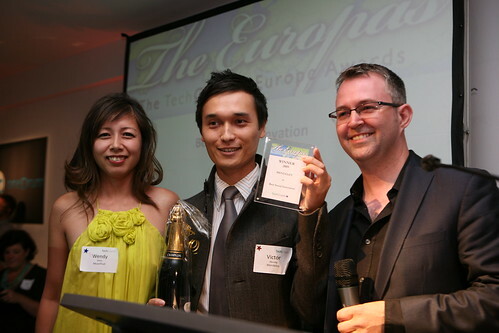 It just occurred to me that, because I went on vacation immediately afterward, we didn’t yet post a photo of our TechCrunch Europas Award! Two weeks ago, we won the prize for “Best Social Innovation (Which Benefits Society)”. Wonderful title, isn’t it? A big thank you to everyone who voted for us, to the Europas jury, to event organizer Mike Butcher and Moonfruit (for sponsoring the prize), and of course our team who made this possible! Here is more information about the event on the organizers’ blog. Ironically and sadly, even though I’ll be on the right side of the pond when this event takes place, I won’t be able to attend – Jan and I will be hosting a session at this year’s Campus Technology Conference in Boston at the same time. However, if you’re interested in these topics, here’s a little reminder about our own Science Online London Conference taking place on August 22. And the winner is… Jonathan Peelle! Last month, we decided to reward loyal referrers who invited at least 3 colleagues via the Mendeley invite tool and entered them into a prize draw to win an ipod shuffle. Last week we’ve randomly drawn the winner and it is…. Jonathan Peelle from Cambridge University! He is a postdoctoral fellow at the MRC Cognition and Brain Sciences Unit researching speech and language processing in the human brain. “There are three things that drew me to Mendeley. The first was the combination of desktop software and the web interface both of which are excellent and support the way I work. In particular having the web interface means my library is always accessible, wherever I am. Second, the ability to share papers with co-workers is fantastic. It enables me to see what my colleagues are reading and saves me the trouble of typing in or searching for references they have. A big thank you to Jonathan and all other loyal users for spreading the word about Mendeley! Carles Pina is a software engineer at Mendeley. He studied computer engineering at La Salle – Ramon Llull University in Barcelona and thought working for Mendeley is a perfect reason to relocate to rainy London. Well, after growing up near Barcelona most cities feel ‘rainy’ he thinks. In his spare time, he enjoys programming in C, Python or C++ maintaining projects like qdacco or contributing to other free software projects. He is also fascinated by attending computer meetings in general and loves traveling. Nicholas Jones is a software engineer for Mendeley Web. 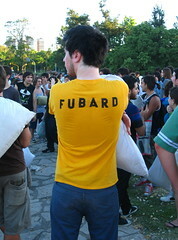 He studied Computer Science at the University of Southampton, graduating with a BSc in 2009. Whilst at the University of Southampton he won the Sir William Siemens Prize for “excellence and innovation on an individual 3rd year project” and the Netcraft Prize for acedemic acheivements in his 2nd year. The year 2009 is halfway through and already we’ve seen some great stuff being published, created, and predicted that could have a major impact in the future. Each of the eight items were chosen because they could influence how every one of us communicates, learns, and lives more so than any other discoveries so far in 2009. What’s that? You’re not a science or techie person? It doesn’t matter, you and everyone else are going to be affected because of the work and ideas brought forth below. So, pay attention. We start with some exclusive, never before public news from NASA, very fitting as today is the 40th anniversary of the Apollo 11 launch. How it affects you: If you’re a NASA collaborator or want to become one, then get ready. As for every day citizens, you too will reap the rewards of Nebula via the research performed. There’s also been a lot of speculation that Nebula will power data sets other than just NASA’s, such as data.gov. Is this true? Let’s put it this way. Their focus, for now, is on NASA’s data. The rest is my opinion only: imagine the possibilities if we had a national or even international cloud computing platform. Remember that it was originally a similar government project called ARPANET that gave rise to today’s Internet. This could be BIG for science, tech, and planet Earth. Hurdles to jump: Kemp and team must first get this rolling with NASA before opening it up to outsiders. And it’s government, so there’s a lot of bureaucracy and red tape to cut through to get this done and costs down. President Obama and Vivek Kundra (Federal CIO), if you’re listening, then help this team out by cutting that tape and give them carte blanche funding to get it done. How it affects you: While the conclusions were based on computer models, the importance of environmental policy cannot be overstated, and now we have proof that policy does work. Oh, and your grandkids will get to play outside in 2065. Even by 2020 it would have been pretty nasty without SPF 3 billion lathered on. Check out these neat simulations, such as the image above. Hurdles to jump: As you may know, we still have a slight problem with a thing called “Global warming.” Lots to do in order to reduce carbon emissions. Besides releasing a new version of Mendeley Desktop we also updated our catalog of research papers, the people directory, public collection pages, and the online library. Now you’re also able to import articles from APA PsycNET, IACR ePrints, and RePEc.